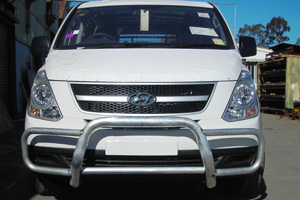 Whether it is dealing with the perils of inner city or regional driving or simply adding some visual appeal to your vehicle, a Formula Offroad Nudge Bar will offer the best possible protection for the front of your vehicle compared to the strength of poor quality, thinner sectioned, imported stainless steel products. 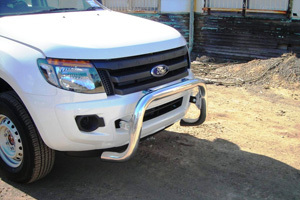 Manufactured using 76mm x 4.75mm thick tube to create the best protection for your vehicle’s front bumper. .
A Formula Offroad Nudge Bar is designed to be fitted to Commercial and 4WD vehicles. As well as providing some protection for your vehicle, a nudge bar can be a handy mounting point for auxiliary lighting and or communication equipment. At Formula Offroad, we pride ourselves on having a niche in the industry by providing nudge bars for early to late model 4wd, commercial and private vehicles. 76mm Low Rise Nudge bar. 76mm / 3inch mandrel bent Alloy tube. Light tabs at rear. More light/ aerial tabs optional. 63mm High Rise Nudge Bar. 63mm/ 2.5inch mandrel bent Alloy tube. Integrated Light bar. More light/ aerial tabs optional. 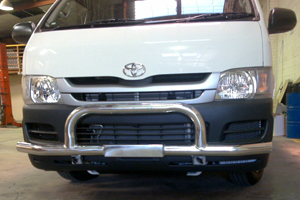 Toyota Hiace Type 10 Alloy Nudge Bar. 76mm / 3inch wall mandrel bent Alloy tube. Integrated light tabs & number plate mount. Type 11 Bar Alloy Nudge Bar. 50mm / 2inch mandrel bent alloy wing tubes. Type 12 Bar Alloy or Steel Nudge Bar. 50mm / 2inch mandrel bent alloy or steel wing tubes. High or Low Rise configuration. 50, 63 or 76mm hi tensile alloy or mild steel tube. Front trade rack option. For people wanting to support longer loads from the rear of their vehicle. 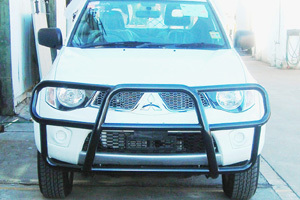 Integrated bumper or headlight protection on Type 10, 11 and 12 nudge bars. 6 or 8mm plasma cut chassis mounted brackets (vehicle depending). Quality mirror polished finish (alloy). Quality powder coat finish (steel). ADR and SRS Air Bag compliant. We are committed to quality and customer satisfaction so you can be guaranteed to get the very best quality product that will last you for years when you buy a Formula Offroad nudge bar. Contact us today and our friendly sales team will be more than happy to discuss your needs for a quality nudge bar.